Nine Indiana State University chemistry students recently presented their organic, computational and biochemistry research findings at the 237th American Chemical Society meeting in Salt Lake City, Utah, after participating in ISU's Summer Undergraduate Research Experiences (SURE) program last summer. The ACS is a nonprofit organization and world's largest scientific society with more than 158,000 members from chemistry, chemical engineers and related professions around the globe that help improve people's lives through chemistry. Eric Glendening, ISU professor of chemistry, stated that ACS understands the future of the profession is in the hands of undergraduate and graduate students. "They provide a place for graduates and undergraduates to come together and meet others who likewise are studying chemistry," Glendening said. "It gives our students the opportunity to present the research they have done." ISU's SURE program allows undergraduate students to conduct research with faculty and give written and oral presentations of their results. Elizabeth Neeley, a sophomore from Worthington, did biochemistry research involving a mushroom enzyme called tyrosinase, which is responsible for making melanin, a pigment that colors human skin. "My research could help companies develop products that would help people with skin coloring disorders make them lighter or darker so it would match the rest of their skin coloring," the Worthington native said. Neeley said attending the conference was a great introduction for her and other undergraduate students going into chemistry. "It teaches us how to organize our research for a journal publication in the future," she said. Andrew Beaven, a sophomore from Marshall, Ill., presented his research in computational chemistry to determine the stability of alkanes, compounds like those in gasoline that are composed of carbon and hydrogen. Computational chemistry involves running calculations on high performance computers and simulating chemistry. Beaven was amazed at how many people are involved in chemistry. "I couldn't believe how many chemists are doing similar things to my work and things not even close to what I've seen before," he said. Kendall Seward, a sophomore from Marshall, Ind., used organic chemistry techniques to determine how to modify sulfur-containing thiol compounds. By attending the conference, she said she realized how important chemistry is. "It is involved in every aspect of life," she said. People are interested in chemistry for medicinal reasons to help pharmaceutical companies develop new drugs, according to Seward. 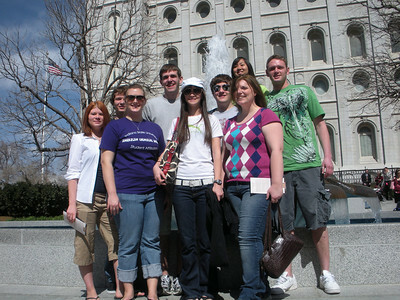 ISU's College of Arts and Science, Office of Academic Affairs, and the local section of the ACS provided most of the funding for the trip. Glendening has taken approximately 100 students to the conference in the past 12 years. "The first meeting a student attends leaves a lasting impression," Glendening said. "I have gone to these meetings for close to 20 years and I always return with new ideas for my own research." Nine Indiana State University chemistry students recently presented their organic, computational and biochemistry research findings at the 237th American Chemical Society meeting in Salt Lake City, Utah, after participating in ISUs Summer Undergraduate Research Experiences (SURE) program last summer.